There are tons of untold Doctor Who stories out there—but none have ever captivated fans quite so much as the almost-aired “Shada.” In the nearly 40 years since it was originally canceled, it has become legendary among Who fans, and a story the BBC has frequently tried to tell, including in a new animated version due out next month. But what makes “Shada” so special? Just about everything. “Shada” would’ve been the third, and ultimately final story of Doctor Who penned by the legendary Hitchhiker’s Guide to the Galaxy author (and Doctor Who script editor at the time) Douglas Adams, off the back of the widely adored “City of Death” and slightly less beloved but still kind of weirdly brilliant “The Pirate Planet.” Six episodes long, and planned as the final story of the show’s 17th season in the winter of 1979, Adams claimed that what would eventually become “Shada” was actually a back-up story he wrote that he was altogether unimpressed with. It was allegedly written in a rush when then-producer on Who, Graham Williams, disapproved of Adams’ original pitch for the season finale—which would’ve involved the Doctor retiring, only to be repeatedly called back into action. Adams, quite enamored with his idea, decided to hold off writing a replacement story, in the hopes that Williams would buckle under time constraints and go with his original script. He didn’t, and so he was forced to use “Shada” instead. The titular “Shada” referred to a Time Lord prison planet, and the story revolved around an alien criminal named Skagra who wanted to locate the hidden world and free a Time Lord prisoner, a psychic named Salyavin, and extort his powers to psychically induce Skagra’s will across the denizens of the cosmos. To do so, Skagra needed to hunt down another Time Lord: Professor Chronotis, who had retired to live a life as a professor at Cambridge University, and possessed secretive Time Lord texts that revealed Shada’s location. Chronotis, sensing impending danger, found himself calling on one of his old protégés from Gallifrey to help defend himself... the Doctor, and his erstwhile companion, Romana. Williams and Adams, who were both planning their exits from Doctor Who at the end of the season (Adams in particular was growing increasingly busy with his work on Hitchhikers), wanted the final story of their last season together to go out with a bang. An increased budget had been acquired so that Adams’ Cambridge-set story, inspired by his student days at the University, could shoot there on location. Although still filled with the charming quirkiness Adams’ past scripts had provided in spades, Williams saw the story as an opportunity to discuss the weighty topic of capital punishment, examining how a race of quasi-immortals like the Time Lords dealt with criminals not just from their own race, but others, as the self-proclaimed guardians of Time. The late ‘70s were a tumultuous time for the UK. Rising inflation and union disputes across the Public Sector had already seen strike action over the course of 1979—particularly in the first few months of the year, as painfully cold weather combined with mass striking lead to a period that would become known as the “Winter of Discontent.” The TV industry was no exception to unions and strike actions. In August of 1979, ITV, one of only three broadcasting channels in the UK at the time, went off-air across the country for 11 weeks due to a technician’s strike, as unions demanded better pay to stave off the rise of inflation eating into worker’s wages. Although the BBC was less affected by strike actions in comparison—in fact, it highly benefited from the ITV strikes, as it meant bumper viewing figures due to the lack of competition—it was still targeted by unions, especially for its more lucrative and highly-viewed shows, like Doctor Who. “Shada” became one such production targeted with union protests. Night shoots on location in Cambridge for what was meant to be a key chase scene early in the story went unfilmed as unions forced the lighting crew on hand to stand down and return to London. The shoots were eventually completed with some shots scrapped, and the Who crew returned to the BBC’s studios to complete three sessions of filming in early November—but only the first ended up being completed. Escalating tension among labor unions meant that when the crew left rehearsals to return in mid-November for the second block of “Shada” filming, the doors to the studios were locked up, and strike actions shut down all filming at the BBC TV Center. Several reasons for the total cancelation have been floated. It’s long been widely believed that the BBC chose to sacrifice Doctor Who so it could film its Christmas programming throughout December instead, seen as vital content that guaranteed huge ratings. But recently, BBC historians came to the conclusion that the broadcaster willingly scrapped “Shada”—instead of reshooting and broadcasting later, as many shows delayed by industrial action were at the time—to show the unions there would be a consequence to their strikes. Ever since its cancelation, “Shada” has become a holy grail for Who fans, and there have been multiple times to revive it over the years. John Nathan-Turner, who replaced Graham Williams as producer in 1980, fought for filming to be completed so the story could be included in Tom Baker’s final season, but eventually gave up. Footage from the serial was eventually used in 1983 for the anniversary special “The Five Doctors,” to explain the Fourth Doctor’s absence from the story after Tom Baker declined to return. But beyond that, “Shada” has still lived on in various forms over the last three and a half decades. Nathan-Turner would eventually help “Shada” get a home release on VHS in 1992, with the story being told through a mixture of filmed footage and new recordings of linking narration from Tom Baker (only kind-of in character), but the episodes were understandably truncated, never fully telling the story. In 2003, Big Finish announced plans to create a new audio drama version of the story as an animated “webcast” for the BBC, adapting Adams’ script (with additions by writer Gary Russell to tweak the story into the modern Who continuity). 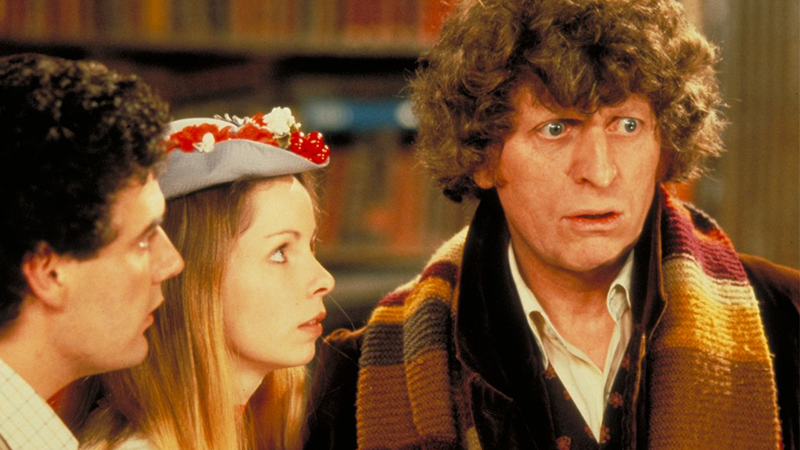 Although Lalla Ward returned to reprise her role as Romana, Tom Baker once again declined to return, necessitating tweaks to have the story star Paul McGann’s Eighth Doctor instead. An expanded version of “Shada” was released a few years later by Big Finish, but the original webcast can still be heard online. Although at first Adams refused to let any of his Who stories, including “Shada,” be novelized unless he wrote them (and was paid a princely sum—too princely for UK Who book publishers Target to contend with), the writer would actually revive some elements of the story in his first Dirk Gently novel, borrowing the character of Professor Chronotis, functionally identical to his “Shada” character but sans references to the Time Lords. It would take years afterwards for “Shada” itself to make its way to the written word. Based on Adams’ script, Gareth Roberts’ 2012 novelization—including new material Roberts intended to fill plot holes and embellish certain mysteries Adams had left unanswered, offered a zippy, fresh version of the story, one arguably more fun that the final product ever would’ve turned out to be on TV. Meanwhile, fans also attempted to resurrect the story in various forms. Infamous Who superfan Ian Levine, who has previously helped return missing episodes of Doctor Who to the BBC archives, privately funded an animated restoration of “Shada” in 2010, and even managed to convince most of the cast back to record dialogue for it... except, of course, Tom Baker, who was replaced by a questionable impersonator. Despite Levine’s hopes the animation would be picked up for official release, it never was, remaining mostly unknown until it leaked to torrent sites in 2013. That brings us to 2017, with the BBC’s latest official attempt to do “Shada” justice arriving later next month. Using a mixture of remastered versions of the originally shot footage, and new animation in the vein of previous releases of “missing” Who stories like “Power of the Daleks” and “The Ice Warriors” (this time with Lalla Ward finally being rejoined by her original co-star, Tom Baker, to record new dialogue), this latest attempt hopes to be the definitive take on Adams’ story. It’s hard to say whether it will be, though. “Shada” and its status as a untold tale has become too ingrained in the history of Doctor Who to ever really be truly finished—the allure of a never-told slice of Douglas Adams-written Doctor Who is far too strong to be dampened by the closest thing to the actual thing really making its way out there. It’s already lived for nearly 40 years in the hearts and minds of Who fans. Who’s to say it can’t live there forever?